That surprises people because I am such a fall and winter fanatic. January means a time for renewal. It’s a time to look ahead to a new start. It’s a time to move away from the holiday frenzy and welcome in the winter quiet. Gatherings with families and friends are replaced with peaceful nights with a cup of coffee by the fire. Bundling up for an outdoor run and coming home to a hot shower and stew in the crockpot are the makings of a great day. I have put away all the holiday baking supplies. The menu no longer consists of cookies, bars, big family meals of ham and dressing. There isn’t a green bean casserole in sight. No decadent mac ‘n’ cheese in the oven. The hot chocolate station is back to just chocolate without all the heavy toppings and spirits. They have been switched out for plenty of fresh seasonal kale, cabbage, Brussels sprouts, sweet potatoes and spaghetti squash. I have a freezer full of beef, chicken, salmon and shrimp just waiting for plenty of vegetables to make quick healthy weeknight meals. I have bright citrus fruits ready for snacking, flavoring water, and hot tea. My tried-and-true January recipes for healthy soups, stews, and comfort foods are ready for these cold dark nights. Let’s settle in and enjoy January. Put the kids to bed and grab a blanket and good book. Spring sports and celebrations will be here before we know it. I like making some actions steps for each month. 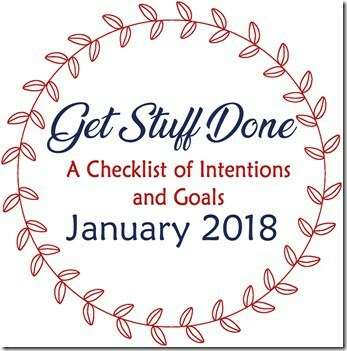 Focusing on specific objectives on a smaller scale might work better for me than year-long goals. 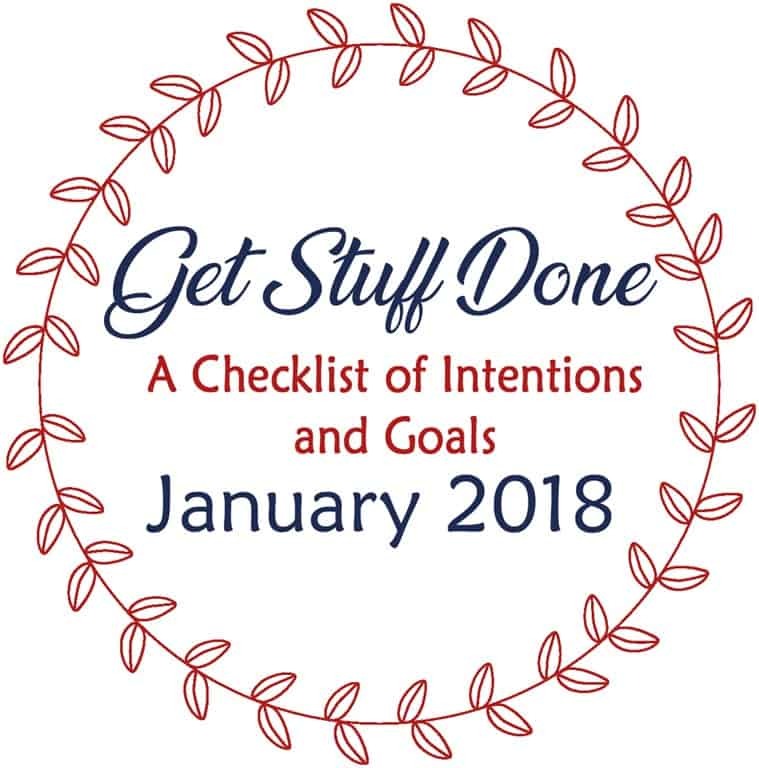 I talked about my need for purpose, and one step in that journey is making a list of intentions or goals each month. Here is my list for January. Empty one storage box a day. We still have a LOT of unpacking to do. It’s overwhelming to think about. I need to work one box at a time and either find a place for the items, throw away, or add to the donate pile. Create a working schedule and to-do list. There are still several projects to tackle with moving in to the house. I also need to create a housekeeping and cleaning schedule so I’m not frantically spending my free Saturdays or working late into the night on Sunday. Meal prep at least 2 weekends. I haven’t done a weekend meal prep since early in the RV days. I used to do it every weekend and I loved it! I now have all the space and 2 ovens to use. Meal PLAN and SHOP. I’ve been way too comfortable with the “run to the store for dinner” routine. I spend so much more money doing that. Starting this weekend, I need to spread out the cookbooks and notebooks and do a proper meal plan and then go shopping on Saturday. This should be an every weekend thing, if we are not traveling. Stay on schedule. I have a schedule. I want to stay with it. I have a purpose, STAY WITH IT. Create a working maintenance and project list. I’ve made some really good formatting and design changes over the last few weeks. I have some things that need a lot of time and direction to accomplish behind the scenes. HTML coding stuff is the bane of my existence but I can focus on one task at a time if I have a workable list at hand. That’s it! I hope to start on some of these this weekend. It will take some time to get the schedules and lists finalized because I want to be as thorough as possible. It’s a good thing I have plenty of space to keep my notebooks and jot books. I’ll check back in at the end of January to see how this all worked out.